“Visitors from outer space!” screamed Mrs. Wilmot. “That’s what it looked like…a scene from Star Wars! Little men were scrambling over the side of the 500-ton mass of rusting metal with Spanish letters scrawled across its bow!” It was Spanish all right—Venezuelan to be exact—and the “little men” were the crew of the cargo ship, Mercedes, abandoning their vessel for fear of fire or further collision. 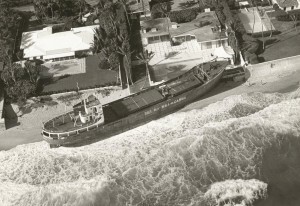 A cargo carrier that usually called at Caribbean ports with food stuffs and assorted provisions, the Mercedes was blown off course in a turbulent sea, lost all engines and drifted aimlessly into Mrs. Wilmot’s seawall and swimming pool Thanksgiving Day, 1984. It took over two months for the Florida State Legislature and local politicians to decide which funds to use to remove a derelict with no insurance. An abandoned Mercedes had never been a problem before in Palm Beach. Palm Beach’s nightmare became Ft. Lauderdale’s dream: an artificial reef that recreational divers and fishermen have embraced. 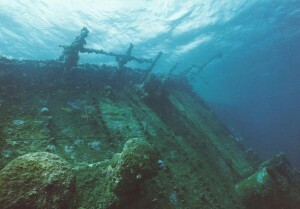 Sunk in 1985 by volunteers from the Broward County Artificial Reef Program, the Mercedes became a popular dive site. 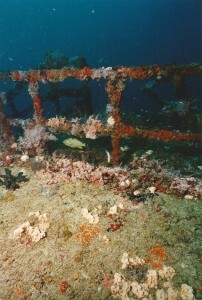 Within a short time, coral, algae, sponges and schools of tropical fish made their homes in the ship that was once a big pain in the neck and an eyesore for Palm Beach residents. This is an interestng story and when I go to Florida I will try and dive the Mercedes. Is there much left of it? 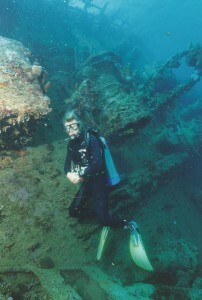 Safe diving to all. The Mercedes has taken a lot of hits from storms throughout the years. It is scattered about the bottom, but has accumulated lots of heavy coral growth. This in turn attracts a variety of fish and other marine life. Peek into the cracks and crevices of the hull plates and other parts of the wreckage and see what critters are making their homes there. Good luck. Let us know how your dive goes. Again, quite an interesting article! I liked the way you described how the ship ran into the swimming pool of a wealthy community. I wondered how that could happen, but when you mentioned the sea wall, it became quite clear. Clever writing and, adding that it missed the Kennedys, gave it more intrigue! I find this story facinating! Is there a website to view more pictures of the actual ‘landing’ of aliens in 1984? Thanks to Dr. Shockley for the kind comments. It was indeed strange how the vessel ended up right next to Mollie Wilmot’s swimming pool. (Mollie died in 202). To Deb: Here is something interesting. Thanks to you and your question, I found seven pictures (including some newspaper articles) about the Mercedes. Go to Google and put in: Mercedes Grounded Palm Beach. Then open: “Mollie and Mercedes: 25 years later–Shiny Shots Palm Beach.” I hadn’t seen this and it is quite interesting! I have read most of your books and i have enjoyed all of them . Keep writing i will need more books to read..
You are a faithful fan. Your interest and love of adventure is appreciated.